Monday, Tuesday, Wednesday, Thursday, Friday. We fall into a rhythm. The rhythm becomes as fluent as brushing teeth in the morning; it requires no thought. We all head to our small brick building that rests on the middle of East Houston street, where a vibrant high school and college is in motion. Here, teachers and students gather at round tables to share ideas and perspectives. To arrive at this place, we each have our morning commute. Frequently our commutes involve public transportation and, therefore, someone taking us. 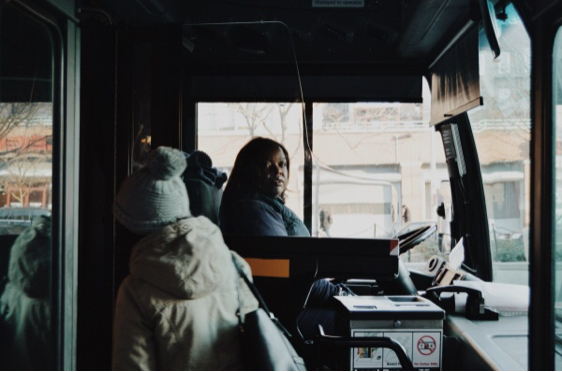 On these weekday mornings, while sitting on your method of transportation, have you asked yourself the question about who is driving you, what their life might be like? If they have children who are in school too, and what crazy hour they may have woken up in the morning to pick you up? You most likely you have not. And understandably, you may actually have no idea who brings you to school each morning and takes you home each night. First I will introduce you to my commute. At 8:20am and 3:30pm, I take the M21. The M21 travels cross town, rolling up and down East Houston. This bus possesses neon blue seats, mini signs taped on the windows politely directing passengers to give their seat to the elderly, and simple red buttons placed on silver poles which passengers tap to inform the driver that their stop is next. This bus that I did not know how to navigate at the start of the school year has now become familiar. And while the physical bus has become familiar to me, so have the people who drive it. At 3:30pm on the corner of Colombia and East Houston, the blazing yellow letters of the M21 pull up to the curb. I walk up the 3 steps to get on the bus, and slide my green and white metrocard in the scanner. Before I take it out, I say “hi” to a man who sits behind the wheel of the bus. He wears thick black glasses, similar to ones Malcolm X wore, with an energetic MTA navy colored shirt that looks as if it has just come out of the laundry being so bright. The man has a battered smile, giving the impression that he uses his smile often. Michael flew out to Jamaica where he and his now wife were married at the local church in Kingston. They had a small ceremony, which a few relatives and friends attended, and in less than an hour were declared husband and wife. After the ceremony which took place on a Saturday, photos were taken underneath the magnificent, tropical sun. He showed me one of them, where his wife was in a white, glittering dress and he wore a red tuxedo, which he claimed was his favorite color, both of them hand in hand smiling brilliantly. Michael told me that after the event, everyone went for a traditional Jamaican lunch that consisted of delicious jerk chicken and festival bread (a local delicacy that consists of fried bread). Michael then had to fly back home and continue to work but his wife will be joining him soon in a few months to live in New York with him. While exiting the bus on the Tuesday afternoon he shared this story with me, I looked him in the eye and simply said, “congratulations.” This interaction I had with the bus driver gave me a whole new perspective on how he is not only a person who brings kids back and forth from school to home everyday, which he does, but that he too has a love life, and he too wants to talk and share his best moments with others. Without chatting with the bus driver that picks me up everyday at 3:30 I never would have learned that he is now trying to bring his wife to the United States to live with him so they can be together, and I never would have known that he has been a bus driver for 30 years, and as a 54 year old just got married. We should all talk to the people who get us to school everyday, despite what position the person is in, steering a wheel or sitting in a comfortable chair. Because we sometimes forget that these people are people too, and a little conversation and a few questions brings more humanity on both ends. It’s also simply a truly nice way to start or end a day. So thank you Michael and all of the other people who spend their time taking all of us, to school.